I developed PTSD between 2004 and 2009 in Iraq. 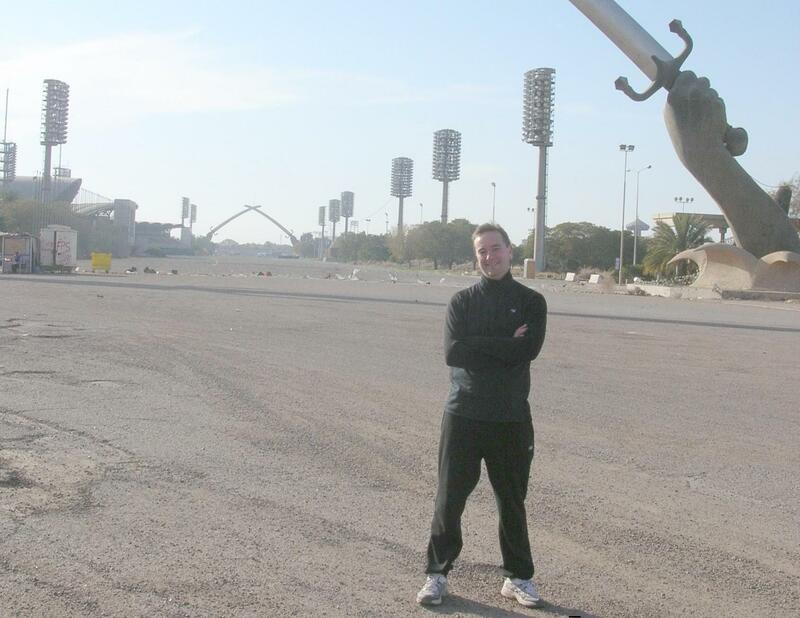 During this period I was one of a small group who had acted as the BBC’s Baghdad Bureau Chief. We took it in turns to spend a month in charge of the bureau. At the BBC all deployments to high risk locations are always on a voluntary basis, but my times at the helm coincided with some particularly nasty events, including the bombing of the Askari Shrine at Samarra in 2006, and in 2008 the damaging of the bureau by a rocket fired by militiamen from Sadr City. I might write more about these and other events, but in the meantime you can get a broad idea of my times there by following this link. My PTSD was not brought on by a single event. It was more the accumulation of 13 tours of duty, working long hours, with windows being rattled by explosions several times a day, and dealing with colleagues in London. But it was the rocket strike on the bureau roof in May 2008 that prompted me to think I might have a serious problem, and to write my first poem since my student days. I dealt with the actual incident well. The rocket fell short of its intended target - the Green Zone – and struck the bureau (which is central Baghdad). It was a Friday, and my tour of duty ended on schedule the next day. I travelled back to the UK, and on the Monday I walked in to Television Centre to hand my flak jacket back to our Safety Stores. I don’t know what I expected, but I had not anticipated that my managers wouldn't talk to me about the incident. I should emphasise that my team and I were extremely lucky to avoid injury or death in the attack, which made news around the world. Since then, more BBC managers have been trained in trauma awareness to help them to support their teams. But the lack of any follow up for me in London at that time proved to be extremely psychologically damaging. I went away with my family to the Trossachs in Scotland feeling that no one cared whether I lived or died. It’s a beautiful and peaceful area, and as I stood alone one morning looking at a loch, I saw a ripple line move along the surface of a lake towards me. I could tell it was a blast of icy air making its way down the valley, an obvious parallel with sitting on the balcony of the Baghdad bureau listening to the incoming rocket. Across the length of the water. Then I heard it whispering. Casting their dark blue shadows. Then I felt it coming. In my face the icy passing. A few days later, I thought I should make the connection explicit by adding a second part. Through the womb of history. With a haphazard crash site. Then I felt it screaming. In my face the fiery passing. So as early as 2008 I was distressed, and in retrospect I was already suffering from PTSD. 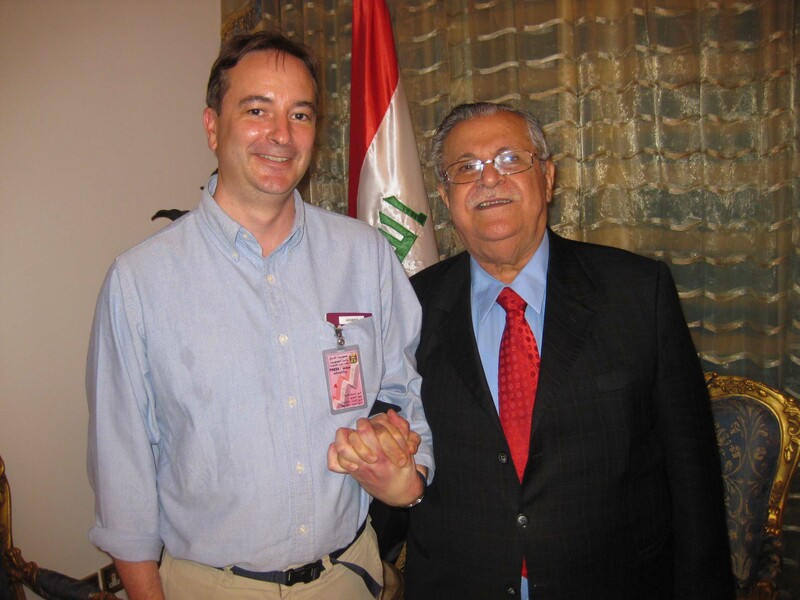 I made further trips to Baghdad, my last being in 2009, when on the prompting of my friend Jim Muir, President Talabani was kind enough to call me "a friend of the Iraqi people". But it wasn’t until January 2010 that it became unmanageable. I was thrown over the edge by listening to a witness at the Chilcot Inquiry into the Iraq War. His evidence made me so angry I stopped sleeping. In fact I had no more than two hours sleep a night for the next three months. When I did sleep, I had nightmares. These were not usually filled with images from Iraq, but they were all disturbing, sometimes violent, and always horrible. And I always knew what they were actually about. And one day on the way to work I had a horrible flashback of my time in Iraq. In 2007 147 people had been killed by a bomb attack on a market in the Baghdad neighbourhood of Sadriya. It’s relatively close to the bureau, and we could hear screams from the roof. It was an exhausting and extremely traumatic day, and it returned as I made my daily commute. I didn’t remember it, I re-lived it. The rain pummelled the train trundling through the suburbs. And obscuring with greyness the greyness outside. On the inside of the door in an extravagant swirl. Perfect but for a slight tilt to the west at the top. A hundred and fifty people. Now I smell them burn. I had a wide range of symptoms, from panic attacks, unreasonable levels of anger, avoidance of anything to do with Iraq, and terrible feelings of isolation and loss. Because of my lack of sleep I was often exhausted and impatient, and loud noises scared and angered me. My memory was impaired, as was my appetite, and I lost around ten pounds in the first few months of 2010. Despite this I was coping reasonably well at work. It was an interesting and challenging time, covering the most open UK election in living memory. But I was not coping at home. I was difficult to live with, and communication with my wife had pretty much broken down entirely. Eventually it was too much, and she told me she no longer loved me, and wanted me to move out. I was very distressed, but was able to see that she was right in courageously recognising that our marriage was over. It also gave me the impetus I needed to seek help, and for that I'm very grateful. My lovely teenage son and daughter were tremendously supportive and have made it really easy for me to maintain contact with them ever since. I moved to a shared house in a pleasant green part of west London. In some nearby allotments, I saw two magpies bullying a fox cub on a beautiful late spring morning. It made me feel terrible – my guilt, my sense of failure all contributed to the shame that pervades the poem. Warmth had finally come to May. Making a make-do hedge to keep out the walkers-by. And in a turned-over plot, among onions, I saw the young fox. Only ten yards away, but separated from his exuberance and vulnerability. Would never touch his, and his was his alone to do with as he pleased. Then a harsh cackle broke in on our shared separateness. World would never impinge on their domain, as the fox had dared to do. Kingfisher as they strutted about, assured and vicious as dinosaurs. Intent instead on the mammal warmth the spring gave his game. Guided by a malicious intelligence that evolved before reason or love. Hitting home, striking into the red-brown fur, snapping at now his ear, now his tail. Cowered in a clump of thistles, and then slunk away to the derisive laughter of his tormentors. At this point, in this frame of mind, I realised that I needed to get some help. I talked to my manager and was offered specialist psychological support and time off from work to focus on the treatment until I was ready to return. After an assessment, I began my EMDR and CBT counselling. It was extremely harrowing and difficult, and there were days when the world looked very black indeed. After each session I felt exhausted, and would have to fight to stay awake on the tube on the way home in mid afternoon. And sometimes I’d be overwhelmed by grief. But slowly I began to feel an improvement. Snakes without fangs, or yet to learn the art of venom. Me gasping, drenched and naked, lashed by the double-edged luck of the survivor. The therapy and counselling was helping. So too was my new girlfriend, Inge Schlaile, a beautiful Bavarian artist and journalist. She was quick to acquaint me with the differences between the Bavarian dialect and Hochdeutsch, the formal language of Germany. For me the most interesting was the lack of a word for love in Bavarian, using the phrase “I mog di” (I like you) instead. “I mog di” is the best you can Hope for in Munich. And their Love needs no word. My Bayerin said nothing, but held my hand. From this it should be clear that things were beginning to look up for me. The therapy was exhausting, and I had to take the whole of August off because of this – the first sick leave I had taken as a result of my PTSD. Things steadily improved, and I spent part of that month in Munich, where Inge held an exhibition, and where I found an interesting story I wrote up for the BBC website. It was a happy time for me in Munich, and I felt like I had moved on. I returned to work, and was busy at the UK political party conferences. But I managed to squeeze in a very brief visit to the Oktoberfest in Munich, and to write a poem expressing this sense. To rot and stain the pavement. A leaf ghost of my past self. But I wasn’t out of the woods yet, and my condition had a couple of nasty surprises in store for me. Inge and I went to Copenhagen. We had a good time, but I found the people remarkably unfriendly (probably just an indication of how I was feeling rather than a reflection on the Danes). And during a visit to the beautiful Louisiana Gallery to the north of Copenhagen, some dark clouds began to gather, prompted in particular by a sculpture by Alfio Bonanno. In a Danish wood by the sea. One has to go ahead of the other. Parting and one must lead. This journey together to the end. My brave lover decides not to notice. One of us has to go first. And then the most surprising twist for me. Since I started going to Baghdad I have developed a slick routine for going through security checks. This involved wearing a belt with a plastic buckle, keeping my change and phone in my bag, and other stuff designed to allow me to sail through. At Copenhagen airport none of this cut any ice with the security staff. They made me take off my shoes, my belt; empty my bag – the full works. It took me back forcibly to the hell of Baghdad security, and the traumatic effort of getting through the airport and out of the country. It also raised other issues that I’m not ready to share here at this stage. But it also took be back to a particular incident, where a sergeant from the (former Soviet) Republic of Georgia refused me entry into the Green Zone. I was alone, and he forced me to wait on perhaps the most dangerous corner in the world at that time for fifteen minutes until my security team collected me. The images flooded back, not as memories but as re-experienced events, and by the time I was back in London I was deeply distressed. Physically repel us from one another. In the distance between souls. However my therapist was very good and it was all stuff that had to come out. And I moved on. I think it was at this time that I fully recognized that I wouldn’t be going back to Baghdad, and that my life and my career had changed forever. Not an entirely bad thing, you might say, but you have to remember that for me Baghdad had become more normal than London, and it prompted nostalgia pangs. This is a District Line service to Upminster. Please move down inside the carriage. The next station is Sloane Square. This is a Lake District Line service to Blencathra. The next station is Victoria Falls. And had the last of my work adrenaline. The next station is Sierra Leone Square. Solidly packed in with the rest. Iraq had another bite at me. I was incensed when I heard Carol Ann Duffy and some other poets had written Iraq "War Poems". They had appeared in the Guardian Newspaper more than a year earlier, in July 2009. But it was only during a weekend trip to Paris that I was able to articulate why it annoyed me so much. They look like they’re dusted every morning. Of the atelier, not the real thing. Visceral reality muddled with image. This brings me to the end of 2010, when I wrote two more poems, after a lovely trip to Munich with Inge before Christmas. The scenery was lovely, and the paintings of the best German Romantic artist (on display in Munich) were fresh in my mind. All the way to heaven. The mirror calm Schliersee is very cold, but not yet freezing. The steel blue, welding one element to another. 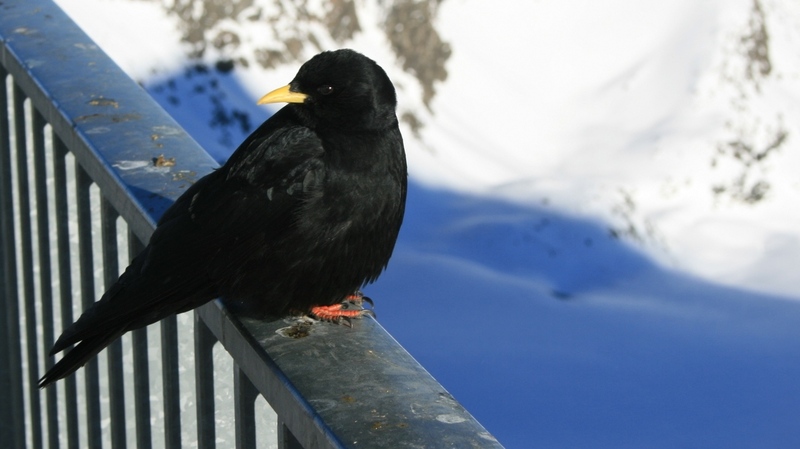 We went up the Wendelstein cable car, and there I saw again Alpine Choughs – a bird I’d first seen when I was 14, and which I’ve loved ever since. Brilliant white cloud only by their angularity. The storm here was wild, and will be again. With a world at wing-tip, they choose the summits. Earth only at altitudes apt to blend with heaven. Forced to ground only by empty stomachs. Disown any family connection to rook or magpie. And the sheer glory of their lives. PTSD is a horribly lonely thing to have, and a recurring theme in these poems is isolation. But there is hope, and I have shown that it is survivable. My life is better now that it has been for many years. I realised the extent to which I had changed when I returned to my home county, Lancashire, to cover a by-election in January 2011. It was clear to me that my perspective has been changed forever. In all weathers, all seasons. It was a constant reference point. Pointing to my future and my escape. To an eternal ever-changing shadow-painted land. To far more blood-thirsty monsters. Looking once again towards Winter Hill. To compensate for my change of angle. From where I now stand, the familiar is very strange. And now Alpine Choughs feature again. These tough, good natured birds told me in Germany that I was better – and another encounter with them helped me realise why I was better. The surface of the sea they were born in. A cloud of ice crystals blasts my burning face. Plunging from cliffs to make my heart skip. The wind that begs and bullies him to fly. Letting go, he embraces his thrilling element. Which takes me to the spring of 2011, when I found I was still capable of getting angry. Above all, don’t think it involves meetings. And persuading him what we do matters. Then I completed my recovery by attending a Hostile Environments Refresher course. On it I mixed with people with more (and worse) experience than me. It was harrowing, but I've emerged from the past year happier and stronger - and from this course proud to be a journalist again. And talking our way through theatrical roadblocks. And the callous indifference of those who stay away. Cremated the corpse, and then wept. And then we leave, we go home, we live. Inge and I travelled to Salzburg in Austria in the summer of 2011. It's a beautiful city, surrounded by maountains. The locals call it "raining threads", and it means you can't see any of the lovely scenery. I thought it was a good analogy for PTSD: when you're in a dark place, you can't see beyond it. But the sun is out there, and you will come to it again. Too slowly to lift the gloom. For thinking it will last forever. By early 2012 I had come to terms with my new life, my new limits, and my condition. PTSD is not something that entirely goes away; my experiences are part of my life, and they have changed me. But where I used to have dark episodes that would leave me prostrated for weeks, now they can come and pass in half an hour. Here’s my poetic take on it. I hope it comforts anyone grappling with PTSD: you’re not alone, and things can get better – they certainly have for me. Just to remind me he’s there. Or a really good book. The respect due to a lion. With a chair and whip. But he’s mine for life. It's clear that I'm always going to have to deal with PTSD; but I can deal with it. Some days are harder than others, and watching the news, for example, can be a challenge. My partner, Inge put it very well one day after a painting session. She complained that red paint never seems to dry completely. Well for me, red means blood, and sadly, it never fully dries. Capture of elusive glinting expression. Red never seems to dry completely. At the end of 2012 I moved to Munich to look after my daughter Clara, who was born in August. PTSD is still with me, though the improvement in my mental state since my diagnosis is enormous. Working through the issues, through therapy and self-examination, is hard, even cruel... but worth it. And pushed through the park. The path fell in last night’s blizzard. And hint of yellow beak. To thick woodland mud beneath. In August 2013 I returned to work at New Broadcasting House, (NBH) the BBC’s HQ in London. I was writing for radio news bulletins, and enjoyed the work, and the company of my colleagues. Some days were a particular challenge. I found myself re-experiencing scenes from my career on the day two men went on trial for the murder of Lee Rigby. The first relates to filming in the Gaza Strip in 2002, the second to Baghdad in 2006. I left the BBC in the spring of 2014, after a few months short of 25 years service. My leaving present to myself was a trip to Orkney, a magical and ancient landscape. And throw it out to sea. Later in 2014 I wrote two other poems reflecting on experiences in Baghdad. Until they killed him too. And this is from 2015 - more distance, less pain, greater sorrow. Pushing my toes into flint. And my muse, Inge Schlaile. To see more of her stunning art, visit www.ingeschlaile.com ; to comment on this site email me at patrick@patrickhowse.co.uk.